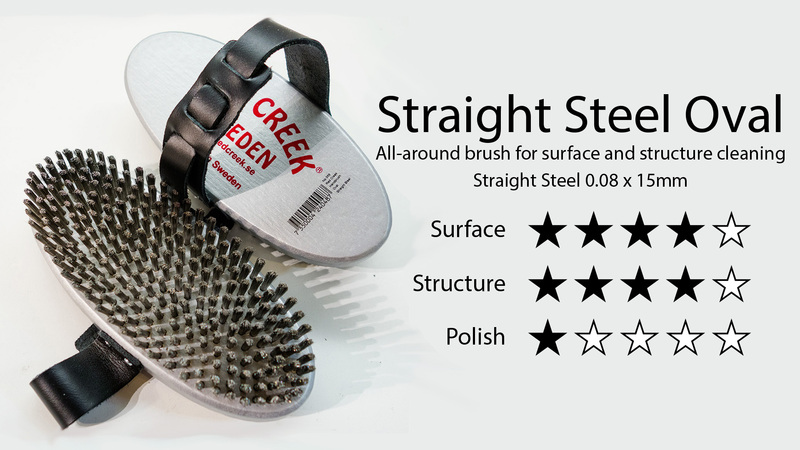 This oval straight steel is an extremely efficient and fast-working brush for all paraffin brushing, including softer and gummier paraffins where it works more quickly than the Gold ultra fine brush. While it doesn't clean fine structure or cold waxes quite as completely or efficiently as the gold brush, this one is a bit more of workhorse, and will move more material more quickly, particularly when structures are coarse (for wet conditions) and waxes are on the softer end. The bristle material is similar to the gold brush, but 0.08mm instead of 0.05mm (still half the diameter of more common "Medium Bronze" workhorse brushes). We have used this brush since getting our first test brushes in Falun at World Championships, and it has quickly become our most commonly used brush in both the shop and race service environments. Like the gold brush, the durability of the bristles is outstanding, yielding years of constant-duty service.